(PRLEAP.COM) The following information will be especially useful for startups and business owners looking forward to bringing their ventures to the web. The WordPress startup bundle is the ultimate pack of ready-made designs, extensions, and graphic elements that are needed for the quick launch of online projects of any level of difficulty, which will also appeal to the target audience. On September 10-14 only, you can download the bundle of 61 items for $49, i.e. the 96% discount compared to the regular cost of $1190 of all items from the pack. The bundle includes an impressive collection of WordPress items that free you from the need to invest extra cash in the purchase of functional and graphic elements for your site. All items from the bundle include the single site license, meaning that you can use 1 item on 1 site. For example, if you want to build 2 or more web pages with the help of 1 theme, then you will need to download the bundle once again. In fact, if you launch business sites and landing pages regularly, then you can purchase several licenses and make a long-term investment in your future web projects. Buying the bundle, you will receive the collection of 61 web design items all at once. You will get 5 premium-quality WordPress MotoPress themes. You can use all of them for the launch of your niche-specific web projects. Also, you will be able to use a collection of 7 premium plugins that are intended to help you boost the performance of your site and make it easy-to-use. You receive the ultimate set of tools needed for the launch of business and startup projects out-of-the-box. The premium-quality 24/7 technical support is provided for free. You can rely on the professional assistance of the customer support team at any step of your business project launch. 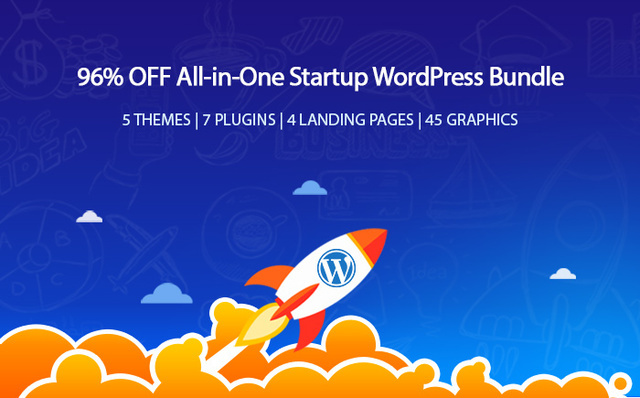 The all-in-one Startup WordPress bundle is made up of 61 items. Let's take a look at the content in more details. MotoPress Content Editor. This is a popular drag-and-drop page builder, which allows you to create custom page layouts code-free. WordPress Slider. The plugin is included to let you enhance the visual appeal of your web page by means of the attention-grabbing slides supporting pictures and videos. The slides are ready to be enhanced with the smooth transition effects. Video Addon makes it possible to integrate catching into different sections of your web page. Google Maps Addon will help your clients find the physical location of your business. Pricing Table Addon reveals the price tags of the products and services that your company offers. Simple Contact Form lets the web users get in touch with your company's representatives, ask questions and order consultations. Countdown Addon keeps the audience alerted on your special offers. "This is not the first bundle that's been added to TemplateMonster digital marketplace. Still, this is the first WordPress bundle that delivers a bunch of MotoCMS and MotoPress items at the cost that is twice cheaper the price of the average WordPress theme. As part of the all-in-one startup WordPress bundle, you are provided with all designs that are needed for the launch of your business project, its customization, visual appeal, and promotion. In a word, the pack is worthy of your time and investments. The offer is limited. Hurry up in order to download the pack for $49 only!" – Demetrio Fortman, COO at TemplateMonster.